Students these days want to make their hobbies as their career options, for which they are on a lookout for vocational courses. DU is known for the traditional undergraduate courses, but the trend lately has shifted to vocational training. 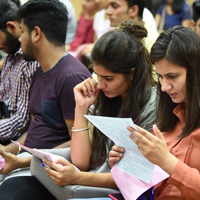 “Vocational courses being specialised courses impart practical knowledge as against the plain vanilla degrees, which makes for greater employability, says Inderjeet Dagar, principal, College of Vocational Studies, Delhi University. Of the 76 colleges under DU, this is the only college offering seven vocational courses at undergraduate level. Employability is certainly higher than the regular courses. “The college has a placement cell equipped with multiple coordinators. Most of our students go for higher studies post bachelor’s but many get jobs with attractive salary packages after completing the undergrad course,” says Dagar. Usually, such industry-specific specialisations are offered at master’s level. BA in Human Resource Management and Marketing Management and Retail Business are the most sought-after courses. The admission to these courses is through the central merit-based DU admission process itself. The merit is determined on the basis of one language and three best academic/elective subjects. These admissions are merit-based with high cut-offs, which is different for all the courses.